Velo had two cycling events over the weekend of July 23rd and 24th. 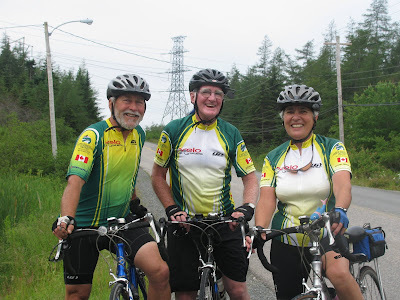 I met up with Jacques and Micheline and Albert of Velo on Saturday in the Sampsonville area as they began their tour of the Cape George/ Dundee loop returning to St. Peter’s via Grande Anse, a distance of 65km. The weather was good and they were looking forward to the ride and to the event on Sunday in Arichat for Bicycle Tour of Isle Madame. PS the picture I took of Jacques was taken just infront of Freeman Sampson's house, where I locked me keys in the car, always make sure to take your keys out of the car before taking a picture of Jacques. And thank you Vangie for letting me call Gary to bring over my spare key. Sunday July 24th, turned out to be a very nice day for the Tour of Isle Madame a group of between 30 and 40 cyclists turned out to do the route. The group left from Dooley’s Pharmacy Parking lot at approximately 9am to start their journey. There were two lengths for the tour, cyclists could pick between the 20 km or the 40 km runs. Following the tour a spectacular Seafood Chowder lunch was served andcyclists were treated to some great local entertainment. It was quite a day for the Velo group and the enthusiasm is definitely starting togrow with Jacques and Micheline signing up new members for the club and even signing up one excited cyclist for next years Across the Highland event. If you enjoy cycling and would like to become a member of a cycling club then you should definitely go to the Velo web site velocapebreton.ca and sign up to become a member. There are lots of events for cyclists to take part in and it is such a great way to stay physically active.